If you look at enough herbal information you may notice a few things. First off, herbs aren't just for one specific ailment, they can work for a wide variety of problems when extracted in the correct medium (vinegar, alcohol, oil, or water) and taken in the correct manner. But what I want to really focus on, right now, is the vitamin and mineral content present in those same herbs. Quite a few herbs are also superfoods, and if they're not officially classified as such, they should be. Most herbs are packed full of vitamins and minerals, many of which are hard to come by in the grocery store. But how do you get the full benefit of these nutrients? A typical herbal tea, brewed for flavor more than effect, is only steeped for 5-10 minutes and contains relatively little plant matter. This isn't going to bring a powerhouse of nutrients to the table. Herbal infusions, brewed for a specific effect, are steeped for 30-45 minutes and may contain a few more nutrients, but more often still are lacking in those. Modern science tells us that vitamins and minerals take a longer time to extract than the more effect specific volatile oils and flavors of the typical teas and infusions previously mentioned. So that leaves us looking for an infusion that takes much longer and requires much more plant matter. Enter, nourishing infusions. Nourishing infusions take about 6-8 hours to steep, this helps to extract the nutrients that we're looking for. Particularly the minerals, as they are the slowest to extract. An average cup of nettle tea, steeped for 5-10 minutes with only 1 teaspoon of dried nettle leaf, contains around 5-10 mg of calcium where a cup of nettle infusion, steeped for 6 hours containing much more of the leaf, can contain up to 500 mg of calcium. Not to mention all of the other vitamins and minerals contained in nettle leaves. This shows just how much more nourishing of an infusion a nourishing infusion can be. Now that we know how long to steep our nourishing infusion, let's chat about how much of it we need, and how much of the herb we need to make it. Most herbalists recommend drinking about 5 quarts of various nourishing infusions a week. I try to go above and beyond, and drink a quart a day, but often end up missing the mark and getting a little over a pint a day (I have a tendency to leave my infusion at home when I have things to do in the mornings...oops), which comes out to about 3 ½ + quarts a week. 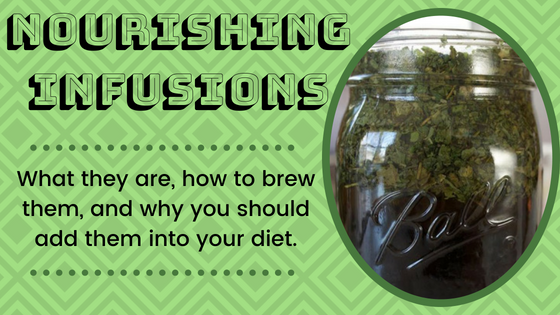 When I recommend people start out with nourishing infusions, I tend to recommend starting with a pint a day, and working their way up to a quart (which is 2 pints). 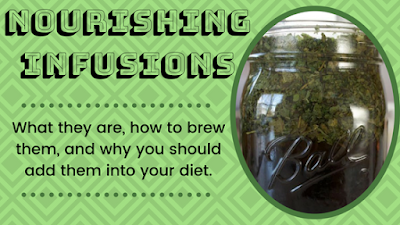 When you're brewing this infusion a pint at a time, use ½ cup of herb(s) in your container (I use mason jars because the measurements are on the sides) and fill it up with boiling water, close it and let it sit on the counter overnight. If you are feeling like you want to go for the gusto, for each quart I use 1 cup of herb(s). When I'm good and don't forget my infusion, I make a pint at a time. I brew one pint before I go to bed at night, then I brew a second pint when I wake up. This way I have 2 pints of infusion throughout the day, and I can add more variety to my daily routine (I'll often opt to use different herbs with each brewing). So what herbs are good to use for nourishing infusions? Realistically, you can use any herb listed as nourishing, as a tonic, or as a nutritive. However, keep in mind that the flavor of some herbs changes drastically over time. Chamomile, for instance, is very sweet when steeped for only 10 minutes. However, when left for 20 minutes or longer, it gets very bitter. The whole point of these infusions is to get more vitamins and minerals into your diet, so you don't want to create a blend that you won't actually drink, because it tastes overly bitter, or just odd. You can also sweeten these infusions, though most sweeteners may take away from some of the benefit, as long as you're getting those nutrients into your system you're doing good. I have some of my favorite blends listed for you below, but I want to introduce you to some great nutritive herbs and give you some tips on making your own blends. Nettle Urtica dioica- This herb is well known to be packed full of minerals and great for people suffering from allergies. It is also a diuretic, so you may experience dry eyes or frequent bathroom trips when taking larger amounts of this herb. Try adding some marshmallow leaves (or roots) or licorice to your nettle infusion to help reduce those effects. Oatstraw and Milky Oats Avena sativa- Yes, this is the same plant that oatmeal comes from. Which means that it's super loaded down with healthy nutrients such as calcium, iron, magnesium, and a wide variety of vitamins and other nutrients. Oatstraw works better over time, and milky oats work better in the short term, to help sooth the nerves and relieve symptoms of fatigue. Oats help to nourish the whole body and is especially good for people who seem to be chronically burnt out. Red Raspberry Rubus spp.- High in vitamins and minerals such as iron, magnesium, and potassium. Red raspberry is especially good for females, as it works to balance female hormones, and tone the female reproductive system. It's beneficial for women during all stages of their lives and reproductive cycles, but especially helpful preparing for pregnancy and during pregnancy. Red Clover Trifolium pratense- Another feminine herb, red clover is also packed full of nutrition. It increases fertility in both men and women, but works especially well for women who have problems conceiving. It's also great for improving the memory and preventing cancer growth. Hawthorne Crataegus spp.- This herb is best known for it's support of the heart, but it's also super packed full of nutrients. The berries are also super tasty. You can use leaves or berries for the nourishing infusions and both help to support the physical heart as well as the emotional one. Alfalfa Medicago sativa- This herb is best known for it's sprouts, which have been consumed, in health food, for decades now. It's well known to be high in vitamins, especially A, C, E, and K4. It's also packed full of minerals such as calcium, iron, potassium, and phosphorous. However, adding alfalfa to your infusion is an easy way to boost your vitamin and mineral intake. Comfrey Symphytum officinalis- This herb strengthens and heals bones, skin, ligaments, tendons, and the mucosa (mucus covered surfaces of the body). The infusion is high in protein, minerals, and most vitamins. It's also contains compounds needed for an excellent short term memory. Spanish Needle Bidens spp.- A local herb, Spanish needle is considered a weed for many a gardener, and a buffet for many a local bee. It's so nutritious that the “founding fathers” of America thought to grow it as a cash crop, instead of spinach. However, they decided to go with spinach instead, because it was so abundant in the wild. The flowers make for a pretty tea, but all aerial parts can be used for a nourishing infusion. Peppermint Mentha piperita- Mints are all so wonderful, and you can really choose whichever you want for your infusion. Each one has a slightly different flavor and overall effect, but they're all super nutritious and have many of the same qualities that make it great for immune boosting, stomach problems, and allergies. Lemon Balm Melissa officinalis- This herb is calming and relaxing, helping to relieve anxiety and depression. It also adds a pleasant, lemony, flavor to the infusion. Lemon balm is nourishing and balancing for the nervous system. Tulsi Ocimum tenuiflorum- Also known as Holy Basil, this herb is an all around favorite of mine. It helps to lower cortisol (the stress hormone) and helps to calm an overexcited nervous system. It's also super tasty and mixes well with just about every other herb out there. Catnip Nepeta cataria- Not just for cats, Catnip helps to calm down anxiety in humans. It's actions are very mild and can be used with children, it may even help keep nightmares at bay. In the Middle Ages, catnip was believed to help prevent insanity in humans. However it is super nutritious and can be eaten raw or made into a nourishing infusion to add a boost of vitamins to your diet. Moringa Moringa oleifera- This plant has recently gained a reputation as a superfood. And a well earned reputation at that. It's not only packed full of healthy vitamins and minerals, but also amino acids and protein. Adding moringa to your nourishing infusion can help boost your vitamin and mineral intake dramatically. Marshmallow Althaea officinalis- This is one of my favorite herbs. The most common parts used are the leaves and roots. I tend to prefer the roots. It's naturally sweet, soothing, and packed full of healthy nutrients. This herb helps to bring moisture to drying blends as well. I tend to add marshmallow to quite a few nettle blends. Steep it either hot or cold, however, if you want to take the most advantage of it's moistening properties, let it steep in a cold infusion. Violet Viola spp.- Such a pretty little flower, violet is also a great powerhouse of nutrition. The leaves and flowers are both useful in many ways. It's great for the heart, but it's also very soothing for the spirit. The leaves are high in vitamin C, but the flowers hold their own appeal as well. One bonus of using the flowers is that they add a beautiful shade of purple to your infusion. Like marshmallow, you can steep it either hot or cold, but to take the most advantage of it's moistening properties, steep it in a cold infusion. Now any of these herbs can be used singly (and herbalist Susan Weed recommends just that), but quite often I blend them to improve flavor, or to tailor them to specific needs (a great woman's nutritive blend involves red clover, red raspberry, and nettle). Adding in some flavorful herbs not listed here can also be good. Quite a few nutritive blends I've stumbled upon elsewhere include cinnamon, cardamom, or ginger. Just make sure you are familiar with the herbs you are using, and if you have any questions, feel free to contact your friendly neighborhood herbalist for more information and safety concerns. Herbs are great powerhouses of nutrients, but they're also potent medicines and should be used with respect. This tea is wonderful for ladies going through every stage of life. It helps balance female hormones, increases fertility, improves the chances of implantation, and helps prepare both mother and unborn infant for labor. It's super high in folate (which is necessary for both female and infant health) and iron. This tea is my go-to for just about every woman I talk to, as well as myself, and the only feedback I've had is positive. One lady even believes this tea to be the main reason her first labor was relatively fast and easy. Sometimes I vary it a little by doubling the nettle leaf and alternating the red clover and red raspberry. Drinking red clover every day for one week and red raspberry for the next. And for the last trimester of a pregnancy I usually recommend leaving out the red clover and doubling the red raspberry. I'll also increase the peppermint when morning sickness is especially rough, or when plagued by nausea for some other reason. This blend is a good, all around, multivitamin blend. It's great for everyone in the whole family and packed full of nutrients. This blend is not just full of nutrients, but all the herbs are considered to be adaptogens as well. They help us to adapt to daily stress, and help to bring us into balance. This helps to reduce our anxiety levels (something every American needs) and improve our outlook. This blend also includes hawthorne, which helps to strengthen the heart, and catnip, which Medieval cultures believed could prevent insanity. This blend is made up of herbs that work best when brewed without heat. Marshmallow, violet, and milky oats all contain compounds that break down fast when exposed to warmer temperatures. Because they work best cold, they may take longer to brew, so I give them 8-10 hours instead of 6-8. This blend works especially well for people who have problems with heartburn and GERD. In any of these recipes, feel free to change the ingredients around. Play with different herbs, but play smart. Herbs are wonderful allies in our search for better health, but they can also be potent. Use them with respect but have fun, play around, and let me know what you think below!